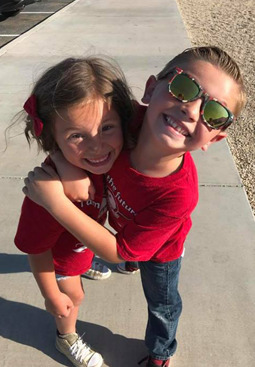 Queen Creek Elementary encourages excellent attendance. Student attendance closely matches student academic achievement. Students receiving a failing grade consistently have a high number of absences and tardies. Developed procedures are intended to involve parents, teach students responsibility, and provide for optimum instruction and academic accountability. Below we have outlined our policies designed for the safety of our staff and students. Please feel free to call or email with any additional questions or concerns. We hope you have a great year! Pursuant to Arizona Revised Statute - ARS 15-802/15-803, students who exceed an absentee rate of 10% are considered truant, even if the absences are excused. A student who accrues 10 consecutive unexcused absences will be automatically withdrawn from school. A student with 18 absences excused or unexcused throughout the year will result in notification to the district truancy officer who may require that all future absences be validated by a doctor’s excuse. Students that have missed three or more days of school can request homework by contacting teachers via email. Parent/guardian must sign students out in the attendance office and show picture ID in order to pick up student. Anyone other than the parent/guardian picking up student must be listed on the emergency information and 18 years of age or older. Students will not be called out of class until parent/guardian has signed student out with proper identification. In order for a student to be excused from class when he/she is late to school, the student must check in at the attendance desk to be signed in. The attendance office must receive a phone call within a 24 hour period from a parent/guardian. A note from the doctor’s office, dentist office, or court system will also excuse a student in lieu of a parent calling. If students are dropped off without a parent to sign them in they are logged in system as an unexcused tardy.